I have attached a powered 1Tb disk drive and a 400Mb usb card as examples, so the important bits from the command is shown below - i have left out stuff not relevent for this How2SetUp. From the above listing you can see that I have a disk /dev/mmcblk0 (the SD Card) which contains 3 partitions - so this is the operating system disk. I also have /dev/sda which is a Terabyte drive which has one partition and has been formatted in HPFS/NTFS windows NT disk format(used by Windows NT,2000,XP,Vista,Windows 7 etc). Finally I have a disk /dev/sdb that is a 4Gb usb card with 1 partition but this time its been formatted in a windows FAT32 format - old style formatted. All the disk drives and partitions attached to the Pi are shown, they are all given a device address such as /dev/sda with a partiton 1 so /dev/sda1 is the disk in the first Pi usb port and is partition 1. To do this we need to create a directory that the disk can be attached to, so in the example below we will use /mnt/disk1 for the 1st Disk and /mnt/disk2 for the second. If you have only attached one device only create the relevent entry for that disk. Depending on the Distro you are using you may need to install this, so do it anyway. 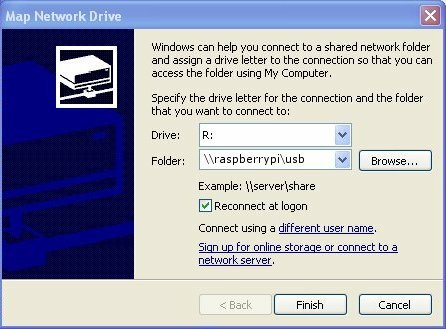 Then finally at the end add your windows share name - i will use a share name of usb and will share out the content of /mnt/disk1 - to share the other disk, add another entry as below with the share name within the [ ] and the path to the other disk drive. 9. Right the samba share is working, however if you reboot the Pi then the drive will not be auto mounted, and therefore the share will be empty - so we will need to install a command called autofs which is designed to automatically mount usb disk drives. This will install the auto usb mounting system.